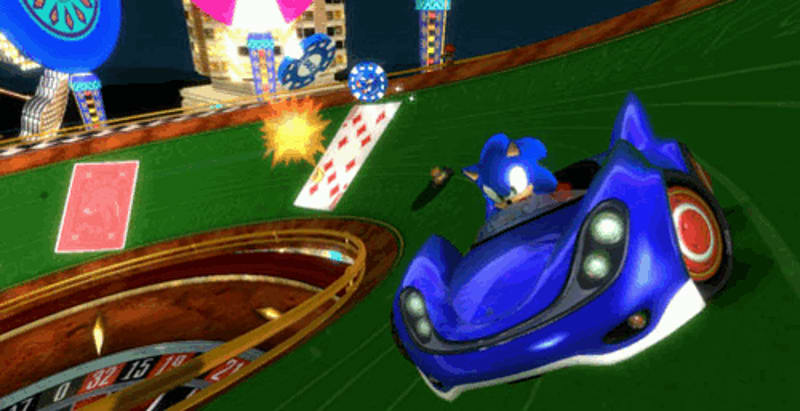 Some of you may have tried the recent demo of Sonic & SEGA All-Stars Racing. Some of you may have disliked it based on that demo. 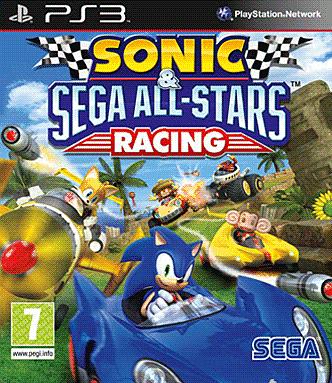 Which is a shame, as Sonic & SEGA All-Stars Racing is actually rather good. Read on! 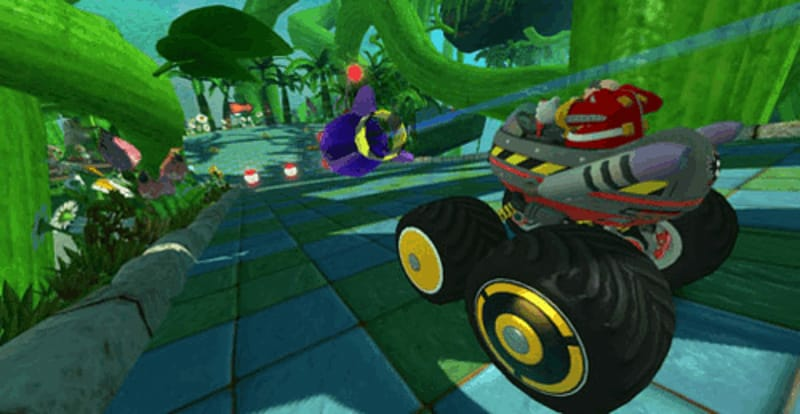 Developed by Sumo, the team responsible for porting OutRun 2, Virtua Tennis and a few more SEGA lovelies to the Xbox 360, Sonic & SEGA All-Stars Racing is essentially Mario Kart with SEGA characters. It isn't going to win points for originality. Still, if you're going to imitate something, it may as well be the best in the genre. Sonic & SEGA All-Stars Racing plunders with aplomb, lifting all of Mario Kart's best ideas, before applying a distinctly SEGA sheen to the whole affair. Packed with SEGA characters, each with their own unique mode of transport, Sonic & SEGA All-Stars Racing will send gamers of a certain age back to the late 90's/early noughties, when the Dreamcast was still a contender and SEGA were on a roll! Blue skies, bright colours, catchy tunes, and a fantastic cast combine in a fun-filled package that's almost pure nostalgia, yet sleek and modern at the same time. Vintage SEGA, basically. Sonic naturally leads the way, with plenty of his chums filling out the roster, including Tails, Amy, Eggman, Shadow and, unfortunately, Big the Cat. The racing line-up is filled out by Ulala from Space Channel 5, Ryo Hazuki from Shenmue, the Chuchus from Chu Chu Rocket, Beat from Jet Set Radio and many more. You might not have heard of all of them, but they're certainly a unique bunch! As you'd expect, the game consists of racing around various SEGA themed tracks against AI or your friends. This it does marvellously, with snappy controls putting you firmly in the driving seat, with a turbo boost charged by using a modified OutRun 2 style drifting system. Like Mario Kart, you hold your boost to charge your drift, but Sonic & SEGA All-Stars Racing has a steerable drift, allowing you to weave in and out of obstacles even as you slide and charge your boost system. It works perfectly, and really puts you in control once you get the hang of it. Another karting standard included is weaponry, with the usual floating pick ups dotted around the track for you to drive over. A fairly standard bunch, with homing rockets, rebounding bombs, mines, boosts, and shields, they do pretty much what you'd expect. The twist comes with the All-Star items, which gives players at the back of the pack a chance to rejoin the race by powering them up in suitably silly ways. Sonic turns Supersonic and hurtles round the track at insane speeds, while Amigo speeds up and locks anyone he passes into a maraca-fuelled conga line! It's a nice feature, and keeps everyone in the race, without resorting to the horrendous Blue Shell/weapon spam of the competition's recent effort. The tracks are a mixed bunch however, with some beautiful and fun courses based on Sonic, Samba De Amigo and Jet Set Radio the cream of the crop. The Monkey Ball racetracks were clearly designed by a sadist though, with right angle turns and drop offs everywhere. Singleplayer mode is split into single race, grand prix, time trial and mission mode. Pretty self explanatory, with the latter playing out similarly to the training in Virtua Tennis or heart httack mode in OutRun 2. Each mission gives you a different goal, and some of them are pretty fiendish to perfect, so there's plenty of replay outside the main racing! Multiplayer can be played on or offline, with up to four players splitscreen offline. While the graphical fidelity drops a little on the split screen modes, they're no less fun for it, and it's great fun with a group of friends. With an option for catch up available, everyone is sure to get a close race, regardless of ability. Online is stable and there are plenty of races going on, so you're never far from some competition! Sadly, there are no multiplayer tournament modes, only single races. Not a deal breaker, but a missed opportunity. Each race earns you SEGA miles which you can spend in the shop to unlock further characters, tracks and music, which is always fun. Even multiplayer races both on and offline earn you miles, so you're always getting closer to new stuff to play with! The tunes are the originals from old school SEGA classics too, so once again nostalgic SEGA fans will feel right at home! As a singleplayer game, there's a surprising amount to keep you coming back for more - Time Trials and Missions have plenty of playability, and the Grand Prix mode on Expert is surprisingly tough. It's ultimately Multiplayer that keeps you coming back in any kart game, though, and multiplayer doesn't disappoint - it's a tight, bright, up all night racer, guaranteed to have you and your friends laughing and cursing! In short, it's the karting game everyone without a Nintendo console has been waiting for!